Natural wood flooring has become increasingly popular in recent years and is both attractive and practical, although they are prone to water damage. Whether your floor is warping from ongoing moisture issues or has been exposed to flooding, you will need to work quickly to prevent further damage. Unlike carpet or tile, natural wood will warp and rot if not properly treated and is expensive to replace. Before any repairs may be made, it is vital that you dry the floor and subfloor as much as possible. This can prove frustrating for many homeowners who have plywood subfloors, as these are naturally resistant to water and make it difficult to reach the underside of the floorboards. However, leaving this moisture not only causes damage to your floors, but it may lead to mold which will both rot the wood and cause potential health problems. Fortunately, most hardwood floors can be restored to their previous condition if dried quickly. Swelling is not uncommon during the drying process, and is temporary. Bowing is also often a temporary problem. Therefore, it is best to begin the drying process immediately. The visible surface of the floor is also the easiest to dry. Open all windows in the room two inches for ventilation and use large fans and/or air conditioning to dry the surface. If there is a puddle, use a mop or sponge to remove most of the water. To reduce stress from swelling or aid in drying, you may wish to remove a row or two of boards across the middle of the room. If you are dealing with a leak, drilling up into the subfloor near the source will help drain any puddles. You will need some industrial fans pointed towards the affected area. In the event you have a finished ceiling, it may be necessary to cut a small hole in order to reach the subfloor. This hole can be patched later. Before attempting repairs, it is best to contact your insurance company and find out what they require. Some companies require the entire floor to be replaced, and many will even cover this replacement cost. Keep all receipts, including any fan rentals. In some cases, your insurer will only cover permanent damage, in which case it will be cheaper to attempt repairs. Usually, drying the floor will be the biggest repair step you will have to make, followed by sanding and staining the boards or waxing your floor. Unfortunately, sometimes there is permanent damage to floorboards or the subfloor. You can repair this damage yourself if you wish to avoid paying the cost for a professional. In some cases, you will need to replace some or all of the damaged boards. This is especially common near leaky doors or windows. Begin by gathering your supplies. In addition to the new floorboards, you will need a hammer, nail gun, staple gun, matching wood stain (an outdoor stain will provide additional protection), vapor barrier paper, wood putty, and an orbital sander. Carefully remove the damaged board using the hammer or a pry bar. Be sure to vacuum any debris afterwards. Cut the vapor barrier to fit and use your staple gun to anchor it in place. You can further flatten the staples with your hammer. Now face-nail the new boards and use your putty to cover the nail heads. Carefully sand the boards and finish by applying the stain and/or waxing the floor. Because it is invisible, one might easily forget about the subfloor. Unfortunately, the subfloor is a vital substructure and damage may compromise your floor’s stability. In some cases, you will have to make repairs before replacing your wooden floorboards. You will need to gather several items before starting work. These include five-eighths inch plywood (exterior grade is preferred), a hammer, tape measure, pry bar, galvanized 8d nails or deck screws, circular saw, and some two-by-six boards for structural support. Set your circular saw to one inch depth and cut out the damaged section of subfloor, being sure to cut past where the damage ends. Vacuum any debris and remove any nails with your hammer or pry bar. Depending upon the size and shape of the hole, you may need to double the support structure beneath the subfloor. Do this by nailing the two-by-six boards, making sure the top is level with the existing framework. Measure the hole and cut your plywood to fit, leaving a one-eighths inch gap to allow for natural expansion. Nail the new subfloor section to the support frame. 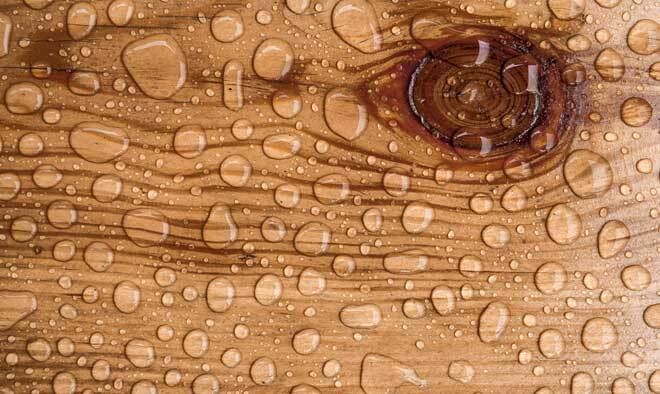 One of the biggest concerns of water-damaged hardwood floors is the risk of mold. In the event you find evidence of mold while repairing the floor, it is important to treat it immediately. Remove all flooring and baseboards within a one to two foot radius of the mold. Begin with the subfloor. Lightly spray small areas using a spray bottle filled with a solution of one cup of borax to one gallon of water, or use a brush and bucket for larger areas. Allow the solution to soak in for 10 to 15 minutes. Scrub the affected area with a stiff brush. Repeat steps two and three, waiting five to ten minutes this time. Perform the same process on affected floorboards, working directly over the infected subfloor to further disinfect the latter. Vacuum the sub-floor using a HEPA-certified vacuum. Allow the floor to dry for at least 24 hours, using a dehumidifier or fans to speed up the process. 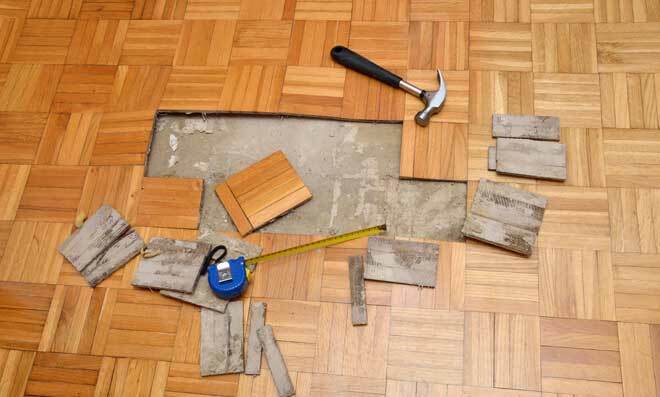 Replace the floorboards only after the area is completely dried. If any furniture was exposed to the mold, treat them before putting them back on your newly-repaired floor. Your floor may have some residual water stains as a result of the damage. Before restaining or waxing, you can remove these marks. Mark off the stained area with painter’s tape. You will need to remove any wax or wood stain using fine steel wool or sandpaper, respectively. Use 60 or 80-grit sandpaper and work up to 100-grit, being sure go to the edge of the floorboard. Dissolve some oxalic acid crystals in one cup of hot water. You can get the crystals at your local hardware or paint store. You will know when you have added enough crystals when they stop dissolving. Use a bush or sponge to apply the solution to the stain. Allow to dry completely, then brush away any crystals. If the stain is still present, continue to repeat the application and drying process. Finish by restaining or waxing the area to match the rest of the floor. Whether you are worried about the insurance risks of tackling a floor repair yourself, are still seeing signs of water damage after attempting to dry the floor yourself, or simply want it professionally dried; hiring an expert may be the best option. What Does an Expert Cost? According to CostOwl, repairs to a hardwood floor range between $250 and $600, depending on the size, nature, and time investment of the damage. Depending upon the company and type of service you request, the price may or may not include additional work, such as mold treatment or refinishing the floorboards. Some professionals offer a form on noninvasive, negative-pressure drying system known as Injectidry. Rubber pads are placed atop the damaged area to create an airtight seal. Suction hoses are then attached to the pads and use negative pressure to pull moisture from the floorboards. This system is also used for other surfaces capable of withstanding high negative pressures. Dr. Mercola provides an in-depth article on mold and its effects on humans. The Mayo Clinic explains the symptoms and risks of mold allergies, the most common health issue triggered by mold.